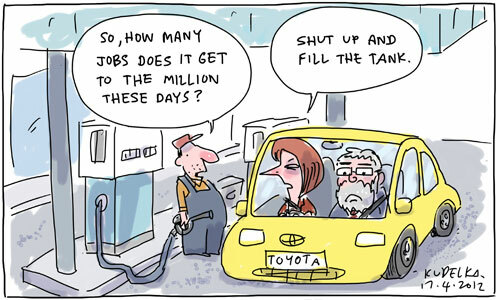 The future of Australia’s car manufacturing industry is very important as many jobs are involved and Federal and State governments have doled out billions in the past to car companies to continue local manufacturing, with the promise of lots more money in the next few years as pointed out by leading Australian political cartoonist Jon Kudelka. During my recent tour of Ford Australia’s Victorian headquarters the President and CEO of Ford Australia, Bob Graziano emphasised that “Australia is one of only 13 countries in the world that can design and manufacture a vehicle from the ground up” and that the recent almost 200% increase in design staff employed at Ford Australia HQ shows that it is more than a manufacturing centre. The previous day Graziano had told the media that “we believe you can have research and development without manufacturing. It clearly helps to have manufacturing and we’re very fortunate in that we have manufacturing, research and development and a stunning test facility”. However Ford spokeswoman Sinead Phipps said that Graziano was quoted out of context and Ford was still considering “what comes after” 2016 when their current “industry assistance” deal with the Federal government expires. Meanwhile market forces have seen Australian car buyers vote with their wallets to shift to buying smaller imported cars, which has forced Australian car manufacturers to continue the cycle of cutting factory output and jobs to match this lower demand for their vehicles. Are federal and state governments kicking the can down the road, merely delaying the inevitable? Would affected workers be better off if governments addressed the reality that unless the remaining car manufacturing plants find new buyers or their vehicles become wildly popular, within 5-10 years the remnants of Australia’s car manufacturing industry and associated parts makers might be a few thousand people employed to do R&D? Instead of doling out regular amounts of cash to the car makers until they almost inevitably pullout between 2016-2021, there could be an orderly shutdown and majority of assistance in the meanwhile be given to car industry employees to retrain them or provide help so they can start a small business. 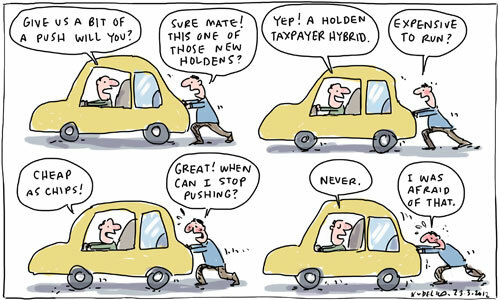 The money saved from car industry handouts could be used to fund transport projects that will result in long term infrastructure eg: offering state governments matching funding for public transport projects. It should not be forgotten that industry assistance to the car manufacturing industry is funded by taxpayers and the cost is therefore embedded in each car that rolls off these government subsidised production lines. Secretary to the Treasury Dr Martin Parkinson recently stated that “If you replace quotas and tariffs with other interventions, no matter whether to create ‘national champions’ or to support so-called strategic industries, you are placing producer interests ahead of those of consumers, and it is still akin to protection. And if intervention isn’t focused, defined and term limited any chance of ‘creating’ comparative advantage will disappear, and it is the poor who typically pay the ultimate bill”. Nicholas Gruen is CEO of Lateral Economics and has been intimately involved in car industry policy from various different positions since his involvement in developing the Button Car Plan as Advisor to Senator John Button in 1984. Gruen told us that “global downturns are the fault lines around which our automotive industry has always reinvented itself. In theory, managers should restructure their businesses and businesses should change hands whenever it improves productivity. Alas human nature intervenes. Corporate dreams are dreamt and restructuring is delayed … until the alternative is collapse”. He emphasised that this current round of Australian car manufacturer job cuts and pleas for industry assistance is different from the past because “we have one more – probably our last – chance to get this right. Ford or GM’s Australian assets would strongly bolster the design and engineering capability of China or India’s emerging auto giants. So if such firms had a stake in our auto assets they’d have the incentive to invest and find a valued place for them in their global supply chain. Right now those firms are cranking up their export of small and medium sized cars for global markets, making Australia hard to beat as a source of larger cars to fill out their global offering”. He closed the conversation with the forthright statement that “Australia’s automotive assets can never aspire to more than back office status whilst owned by the American auto companies. Personally I’d rather the industry closed than limp along devouring billions of our dollars in assistance, with our politicians begging and bribing the clapped out, cash strapped, bailed out auto manufacturers of a once great – indeed still great – power now bent on its own decline for a stay of execution”. Will In Car Technology Reverse Trend of Fewer Young People Driving? These are some of my thoughts are being briefed about the Ford’s plans for connected services such as Ford Sync and touring their newly revamped Victorian centre of excellence for design and engineering. 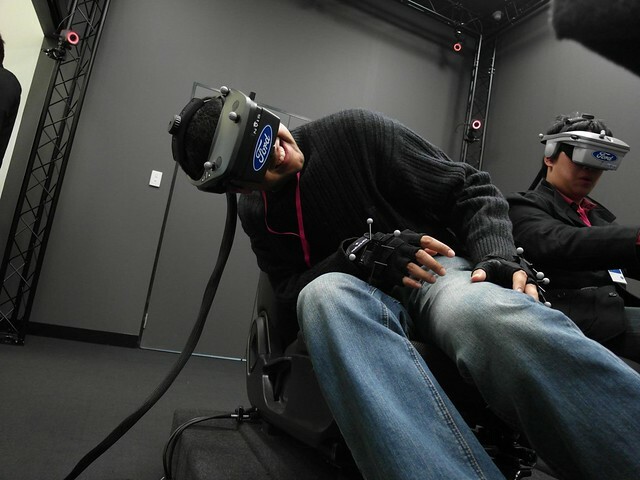 I was particularly impressed by their Virtual Reality Centre which allows designers and engineers to view inside a car design in 3D from a perspective of being seated in either the driver/passenger seat or walking around literally poking your head into the doorframe, suspension etc to see how the components are put together. The safety improvements offered by initiatives such as Autonomous Emergency Braking and Park Assist should also be applauded, with the caveat that Ford emphasised they are most effective within certain parameters and should be used as extra assistance rather than expecting them to work in all driving scenarios. It has become clear during the last few years that Ford, along with the other major car manufacturers, has realised that smartphones and other mobile devices have captured the attention of young adults in a manner which cars used to do as a status symbol and mobility enabler in the past. 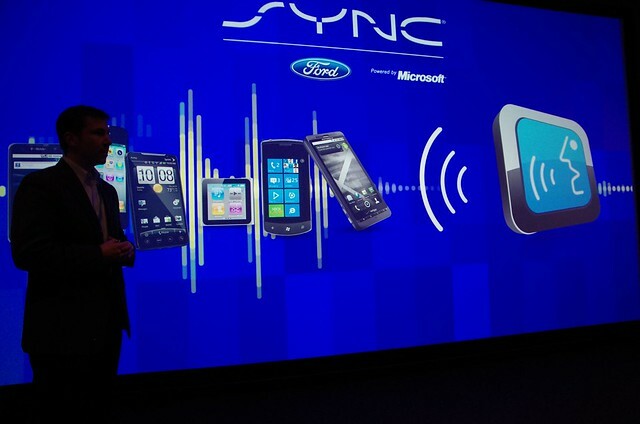 Technologies like Ford SYNC which connect the car to your music collection on a USB drive and enable your car to make hands-free voice activated dial calls on your smartphone are an attempt to make cars cool again. Will these moves pay off or is it already too late? Joe Vitale, an automotive consultant with Deloitte recently told Bloomberg that “for most Gen Y buyers, also known as Millennials, skipping a vehicle purchase is preferable to forgoing technology. 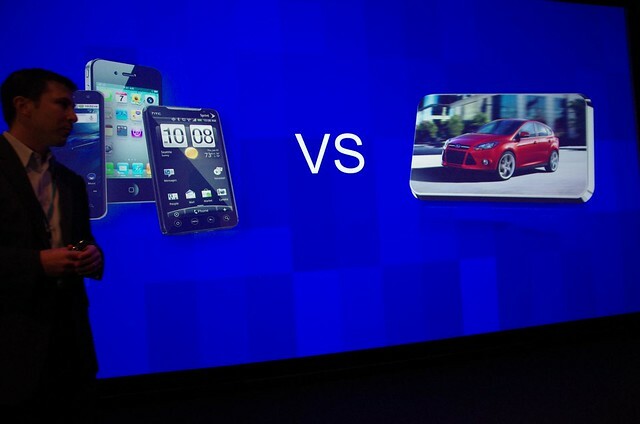 Smartphones, laptops and tablet devices compete for their dollars and are higher priorities than vehicle purchases”. In the USA an academic paper recently released by the University of Michigan Transportation Research Institute states that “in several countries, including the United States, the percentage of young persons with a driver’s license has recently decreased substantially. Results indicate that [in the USA]… the percentages of persons 19 years of age with a driver’s license in 1983, 2008, and 2010 were 87.3, 75.5, and 69.5, respectively”. Similarly in Australia, the NSW Bureau of Transport Statistics (BTS) released a research paper in late 2010 titled Why are young people driving less? Trends in licence-holding and travel behaviour. The paper focuses on what may be the beginning of a new trend, presenting evidence that people aged under 35 are becoming less likely to hold a driver’s licence and therefore not buy a car. The more recent BTS 2010/11 Household Travel Survey Key Indicators for Sydney found that trips for work related business and personal business both declined by at least 7% since the previous period. The BTS believes that this “sixth consecutive year of decline for personal business trips … is consistent with the growing uptake of mobile internet and communication technologies, which allows for the convenience of online transactions”, and therefore lessens the need for a car. Interesting article Neerav. You may also be interested in speaking with the founders of Tomcar – http://www.tomcar.com.au. They are a niche manufacturer of ATVs in Australia and doing it without any Govt handouts. Some years ago it was mentioned that Holden was selling significantly more V8 Utes than V6s. I suggest that this is because the petrol powered vehicles do not appeal to business fleet users, who want diesel, meaning that most are bought either as sports car substitutes, or by V8 fan sole traders. I also wonder if Ford could improve corporates sales of their “ute” (really a small pick-up) if they used the V6 from the Territory in that vehicle.